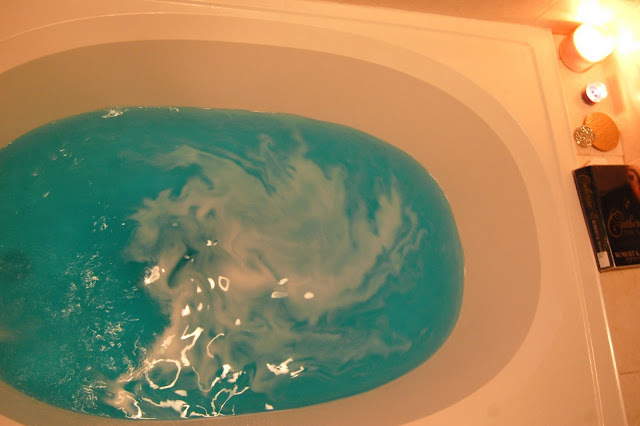 The Big Blue bath bomb (or ballistic) finally got used the other night. I lit my candles, grabbed my book and started the water. 'Ol Big Blue was plopped in and started right to work; bright aqua waters swirling with real seaweed, the lightest white capped foam, and a relaxing soft lavender with some sweet aquatic notes lingered in the air. As I slipped in, I could feel that the seaweed was slick and smooth, no pokey bits. The serene scent dissipated a bit as the candles burned down and pages were turned. When "me" time ran out (and as a Mom, this simple bath time is pure luxury) and the waters drained, I had to push along stray bits of seaweed but there was no staining or residue left in the tub. My skin was a bit thirsty for lotion but the experience was pleasant. The Big Blue created a lovely aquatic experience and will be bought again one day. How do you feel about seaweed or bits of flora floating in your bath? I wish you had one too Deb! I used to think the porcelain claw foot tubs were so romantic until I got in one at a bed and breakfast and realized how narrow it was! I created a dam with my huge hips and the water wouldn't flow behind me. Lol! I bathe about 4 days a week and shower the other three. Bath time is my thing. Our tub still doesn't fit all my bits under water but I will be thankful! Hope you have a relaxing Sunday. It is nice that you can have something like bath time to look forward to at the end of the day! I wish baths didn't sort of freak me out, lol! The color of this bath water looks so tranquil and yet so fun!